Given that we are all products of the age in which we live, it is easy for us to forget that this social experiment that we call “democracy” is still in its infancy. It is only about 250 years old whereas for the rest of human history, as far back as we can go in recorded time; kings in one form or another has ruled people. In Egypt they were called “Pharaoh”, in China “Emperor” or “Empress” in Rome “Caesar.” Before Britain became a united kingdom a king ruled each little fiefdom. Even units of people around the world, that were too small to have kings, nevertheless had lords or chiefs to rule over them. There is a line in the Bible that speaks of God putting eternity in our hearts. One theologian has interpreted this idea of having eternity in our hearts as God placing redemptive analogies in every culture in order for that culture to connect with the Gospel and therefore with Him as their God and Father. I believe this is true. And the fact that the concept of a king has spanned so many cultures over so many millennia suggests to me that there is something hard wired within humanity, so to speak, that makes us want a king. Of course where we blow it is that we are forever picking the wrong king. The Lord God warned Israel against it when they wanted a king so that they would be like all the other nations of the earth. But they ignored the Lord, and rather than having God as their king, they picked a handsome devil that was head and shoulders above all other men. Even back then they were falling for movie stars and models. But it didn’t stop there, when their first king proved to be a failure. They kept calling for more kings. Read the book of Kings and it can be depressing. The next guy is worse than the previous guy. One guy even said to the people, “My father laid on you a heavy yoke; I will make it even heavier. My father scourged you with whips; I will scourge you with scorpions. '” How is that for a catchy campaign slogan? And still they insisted on having more kings. Today is the Last Sunday after Pentecost and it is also Christ the King Sunday. On this day in particular we celebrate that God indeed has given us a King who is the King of kings and so I would like to draw our attention to our King, His kingdom and His subjects and what they all mean to our lives. First think with me how it is that a king becomes a king. There is a wonderful spoof of this in Monty Python’s “Quest for the Holy Grail.” The King of the Britons is speaking with two peasants digging in the dirt. A woman and a man named Dennis. One of the interesting things about a king, and this idea also seems to span all times and all cultures, is that they are king by divine right, and in many cases they are seen as divine themselves. Even as late as the 1940’s the Japanese people considered their Emperor to be divine. King Jesus, is King both because it has been granted to Him by God and also because He is Divine. But what makes our King so different from the kings of this world is how He uses His authority. The kings of this earth maintain their authority through the sword. Without the might of the military they would not remain on the throne and the way that they expand their kingdoms is by using that might. The so-called Pax Romana was very different from the peace of Christ because it was gained and maintained by the sword. King Jesus is just the opposite. He comes into Jerusalem not in a chariot but on a donkey. His authority that we just heard about in Philippians comes from the verses before that describe Him as humbling Himself and becoming a servant, even unto death. He exercises His authority not by the sword but through love. Our hymn today explains why His subjects are so loyal to Him and it is not based in fear. “Blessings abound where’er he reigns; the prisoners leap to lose their chains; the weary find eternal rest, and all who suffer want are blest.” Who wouldn’t want a king like that? Kings of this world use whips of scorpions to control the people. Jesus uses love to compel them to come in. Let’s consider next His kingdom. For many years I thought of Jesus Christ as Savoir, and He is certainly that, but that was insufficient because it gave me too narrow of an understanding on the Gospel. To know Christ as Savior only is to know that one day you will go to heaven and that is that. And what will we do in heaven? Oh I don’t know but I think it includes clouds and wings and harps. So the Christian life is getting saved and waiting to go to heaven. But then I started reading about the kingdom of God and it was as if scales had fallen from my eyes. How did I not see it before? What was Jesus first sermon? It was not, “Pray the sinner’s prayer and go to heaven.” It was “Repent for the kingdom of God is at hand.” And what were His parables about? Were they about how we should behave? Sure some of them are but how many of them began, “The kingdom of God is like…..” And what did He teach us to pray? “Lord let me go to heaven.” No. He taught us to pray, “They kingdom COME…on earth as it is in heaven.” And in Jesus’ revelation to John we do not see folks sitting on clouds with wings playing harps. We see the heavenly Jerusalem, which is a symbol of the Kingdom of God, coming down to earth and making all things new. The Gospel includes our individual salvation but it is so much larger than that. The Good News is the Gospel of the Kingdom where God not only wants to restore us as individuals but He wants to restore all of His creation under the gracious rule of His Son. He wants the kingdoms of this world to beat their sword into plowshares and become the kingdoms of our God and of His Christ. He wants to make a new heaven and a new earth, and as N T Wright would say, put His creation to right, so that the lion will lie with the lamb. How will He do this? It begins with a people who will live as kingdom people, not when they get heaven, but in the here and now because His kingdom is in the here and now. That is what He called Israel to be but they kept choosing other kings. And now through King Jesus that is what He calls the Church to be… we are to be a kingdom people. And this world needs a kingdom people. The tragedies of this world are not going to be solved by the Republicans or the Democrats, Communism or Democracy, Socialism or Capitalism. The wounds of this world will only be healed as the Kingdom of God comes in fullness and the Church is to be an agent in making that come about. But that is easier said than done. We do not become a kingdom people easily. We do not become a kingdom people haphazardly. That is what Jesus meant when He said that violent men take the kingdom by violence. We are to have the same zeal about the kingdom as a warrior does about winning a battle and collecting the spoils. We need to be alert and cautious because like Israel we can so easily lose our focus. The world, the flesh and the devil draw our attention away from the kingdom. Jesus warned that not even family should be allowed to do that. And so Jesus said that we are to seek FIRST the kingdom of God. He told us not to worry about our needs because our heavenly Father knows what we need and will provide. Our focus must be on the kingdom and it must be the priority of our lives. In his book The Good and Beautiful Life, James Bryan Smith offers us some important wisdom that will keep us in line with King Jesus’ priorities. He says, “Sometimes we focus all of our attention on a cause, a discipline or even a commandment of God, which are all essential aspects of being Jesus’ apprentices. But the most important thing is to seek first the kingdom of God. Then everything falls into its proper place. I pray, care for the poor, fight injustice and attend church not because my concern is prayer, poverty, justice or worship, but because my primary concern is what God is doing. When I am concerned about God and his kingdom, I will naturally do these things as they are needed. The moment I put any of them ahead of the kingdom of God, they become idols, though they are good things.” (p.179). For Jesus to be King and to have a Kingdom it requires that He have subjects. His subjects include angels and archangels and dominions and princedoms and powers but the incredible news, the incredible good news of the kingdom is that it also includes knuckleheads. Knuckleheads like the ones in the Bible who lied and schemed and manipulated. Knuckleheads who were flawed and broken and sinful. Knuckleheads like you and like me. But the good news gets better. He accepts us in our knuckleheadedness but does not leave us as knuckleheads, “Therefore if any man be in Christ, he is a new creature: old things are passed away; behold, all things are become new.” He gives us peace and security, that we have been accepted in the Beloved, and He sends us His Holy Spirit to make us new. Like the Good Samaritan He does not leave us where He finds us. But the good news gets better still. While the kings of this earth work real hard at keeping their subjects as their subjects, Jesus does just the opposite. The kings of this world use edicts and taxes and might to keep the people in check. Power drunk democratic governments are every bit as guilty of this as kings. And doesn’t it astonish how people will sacrifice their freedom and give into all of these demands for the sake of the relative security that their earthly king provides. It blows my mind that one billion Chinese have given power to their government to tell them how many children they are able to have. They are ruled with an iron fist and kept in check. Many nations around the world tell their people whom they may and may not worship and in some places it is a capital offense to disobey the authorities on that matter. Dictators, like the ones in North Korea and the former Soviet Union, allowed hundreds of thousands, if not millions of their people to die of starvation while they still found the money to build stronger militaries. And in our own country it boils my grits when our government treats us like a bunch of children who need to be protected from ourselves and go way beyond the constitutional authority to pass laws to keep us in check. What a relief it is therefore to be a citizen of the Kingdom of God. Not only is Jesus not using His authority to keep us in our place, but also He is using His authority to call us to a new place. He calls us to join Him in His authority. As our great High Priest He calls us to be a kingdom of priests to serve our God. As a Son He calls us to be heirs of God and joint heirs with Him. As King he promises to the faithful that they will rule and reign with Him when His kingdom comes in its fullness. Rather than oppressing us as His subjects He calls us to royalty, to be sons and daughters of God. It is said that good theology always leads to doxology and so as we hear what it means for us to be people of the Kingdom living under the loving reign of King Jesus it can only but lead us to worship. I am grateful for the wisdom of the Church in having us set a day aside to proclaim Him King of kings. Amen. I want to suggest that it would be more consistent of those of us who get concerned for the loss of the sacred when Christmas items come out before Halloween, to be equally concerned about Christmas being celebrated during Advent. By the end of the 4th century the season of Advent was universally observed throughout the Church. It is currently observed four Sundays before the Feast of the Nativity. In ancient times it was observed much like Lent, as a time of fasting, abstinence and almsgiving. The idea was to prepare oneself to receive Christ at His first and second comings; to prepare an abode made fit for the King. While today we are not quite so strict in our observance of Advent, we would do well to learn from our spiritual ancestors. Just as many have observed how much more meaningful their Easter becomes after keeping a holy Lent, the same will be true for Christmas. Allow me to offer some suggestions for keeping Advent a penitential season and saving our celebrations for their proper time. Then remember that Christmas is a season and not a day. For the 12 days of Christmas feast and fellowship until the Feast of the Epiphany which is January 6, when the Church celebrates the visitation of the Magi. You may stand out if you are fasting when everyone else is celebrating and then still celebrating Christmas after New Years, but it may offer you an opportunity to witness about living by a calendar that follows the life of Christ whom you seek to follow as your Lord and Savior. One year he came to visit me in Tallahassee and so I took him to an FSU basketball game in the new coliseum. I think it was the happiest that I had ever seen him. The atmosphere was intoxicating. It was high energy with the band playing and what made it even more so high energy was the fans. The FSU fans are brutal! They yell the whole game at a deafening pitch. The pep band has a life-sized dummy dressed as a referee so that any time a ref makes a call that they don’t like they throw the dummy courtside and someone jumps up and down on it. When the opposition is trying to make a free throw the crowd behind the goal does anything and everything to distract him. What made my father laugh out loud was when it came down to one minute before half time and the opposing team had the ball. With one minute to go the crowd started chanting “10,9,8,7…” This got the guy with the ball so rattled that he took a desperation shot which missed and FSU was able to get the ball, come down the court and score before the buzzer sounded. It will always be a great memory for me of time with my father. If you have ever played a sport where the fans cheer you on, like we did at the FSU game, you know that there is a powerful connection between the players and the fans. Something happens that is empowering. I doubt that that power can be weighed or measured or even proven scientifically, but then again neither can love and it is one of the most powerful forces in nature. But if you have played or if you have been a true fan you know that power is real. The players feed off of the energy of their fans and it takes their play to a whole other level. They are able to do things on game day that they would not have been able to do during practice. This analogy of players being cheered on by fans comes to mind when I think of what we celebrate today, which is the communion of the saints. In Hebrews 11 we are given a list of saints that have gone before us. It mentions Abraham and Isaac and Joseph and Moses and Rahab and David and Gideon and Barak and Samson and on and on. Then Hebrews 12 begins, “Therefore since we are surrounded by so great cloud of witnesses, let us lay aside every weight and sin which clings do closely and let us run with endurance the race that is set before us….” This sounds to me that we are to see the communion of the saints as those who inspire us to not only run the race but to finish it and to receive the crown that does not fade away. It has been my experience however that All Saints’ Day and this doctrine of the communion of the saints are not given the attention that they are due. It certainly does not get the attention of All Hallow’s Eve and that is to our spiritual detriment. I read that in the Orthodox Church, All Saint’s Day is considered so important that if you miss it you may not receive communion again until you make a confession. And yet in too much of the Anglican world, particularly if it falls on a weekday, it is not that much of a priority. That says to me that we have not done a good job in informing the Church about this doctrine and its accompanying feast day. So allow me to give it a start. Let’s consider the priority that the Church catholic gives to the communion of the saints. If you pray the Daily Office you join with Christians in the Roman and Orthodox and Anglican Communions, along with many Protestant Churches, and declare that you believe in the communion of the saints. We do this through the Apostle’s Creed, which we also recite at Baptisms and Funerals. And we need to remember that we claim that the Creed is a non negotiable. It is non negotiable because it contains the essentials of the faith that are to be believed by all Christians, at all times and in all places. 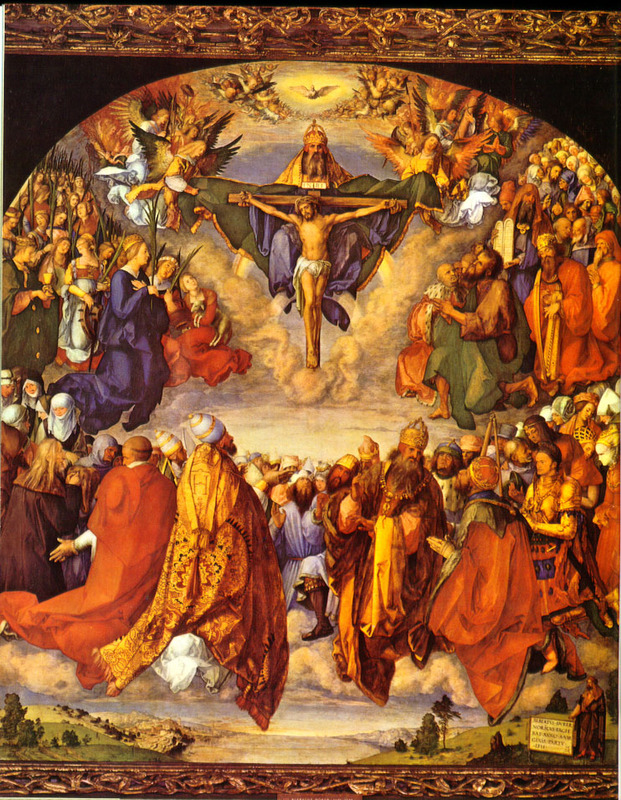 This makes the communion of the saints an essential truth that stands alongside the Trinity and the dual nature of Christ. But why would the Church through the ages make this doctrine so important? This is a very different image than that which is promoted in much of American Christianity that is radically individualistic and might I add, unbiblical. I was a part of a campus ministry that had us share the Gospel with individuals, invite them to say a sinner’s prayer, tell them that they are now Christians and send them on their way. No mention of being baptized into Christ’s Body. No mention of being a part of Christ’s Body. No mention of each of us belonging to the other. And it is that kind of error that gave birth to the type of videos we saw about a year ago about loving Jesus but hating religion, as if Christianity is a purely private matter. That kind of thinking was so far from the understanding of the early Church that one of the Church Fathers, speaking of those who had strayed from the Church said, “He can no longer have God as Father who does not have the Church as Mother.” To put it another way, it is impossible to be joined to God and not be joined to His family. Not being connected to Christ’s Body opens us to false teachings, false Gospels and even a false Christ. Not only is Christianity NOT a private matter it is so corporate that it includes both the saints on earth and also the saints in heaven, for there is only one Body of Christ. We are as essentially connected to them as we are to one another here on earth. That is one of the key points of the Book of Revelation. Rather than digging around in that book to discern which political figure is the third toe of the dragon we are to see that the saints in heaven are praying and pleading for us. We are to see that it is they whom we join in worship as we join our voices with angels and archangels and all the company of heaven. It is why the altar should be on the wall facing east, so that both priest and people together can look to and join the company of heaven rather than the priest facing the people, which contains our worship to this earthly space. We are to see the victory of that part of the Body of Christ in glory and take courage and hope from them so that we will be faithful witnesses in this life even unto death. So yes, the communion of the saints is important. Second the communion of the saints is important because unlike my analogy of FSU having a home court advantage, we don’t have that advantage. We don’t have that advantage because this is not our home. We live in a hostile environment where we are daily assaulted by the world, the flesh and the devil. We fight against principalities and powers. We pray daily not to enter temptation and to be delivered from evil. And so because we don’t have a home court advantage and because so much is stacked against us, we need all of the help that we can get. We need to know that we are not alone. We need to know that myriads before us have finished the race and won the crown. We need to know that heaven is praying for us. Like the servant of the prophet who had his eyes opened to see the armies of heaven, we need to know that we are surrounded and supported. Third, the communion of saints puts our challenges in proper perspective. Unless you are not paying attention it is pretty clear that there is an increasing double standard against Christianity in this nation. Did you see last week that the courts ordered a company to pay $240,000 to two Muslim truck drivers who were fired because they said it was against their religion to deliver beer? And yet Christians are fined and even lose their businesses when they make the same defense, as we have seen recently with some bakers and florists and owners of event sites. It seems these days that freedom of religion is for everyone else but us. As concerning and as frustratingly unfair that is, the communion of the saints remind us to take courage and remember that we haven’t been fed to the lions or boiled in oil……..at least not yet. And so we should not lose hope. The temptation is to throw up our hands and let the world go to hell in a hand basket but that is not the commission that Jesus gave to us. No matter how bleak it gets we are to be living and proclaiming the kingdom of God. We are to love and serve others, no matter how they treat us. We are to fulfill the Great Commission and the Great Commandment and we can’t do that if we are hiding in our churches. The fourth reason that the communion of saints is so important is because it informs us why we are here and where we are going. If you have been a Christian for some time you probably have forgotten or not known the quiet desperation with which most people live their lives. You can see it all over social media. I honestly feel badly for the secularist who thinks that this is all there is and therefore lives their life accordingly. They slug through 5 days so that they can live it up on the weekend. They slug through another 50 weeks so that they can enjoy 2 weeks of vacation. They try to be happy and they hope to have a meaningful relationship with someone but often even that falls apart. They lack a genuine sense of purpose so they latch on to a cause or two on order to find meaning. But then when they are honest with themselves they discover that the cause that they have embraced, with religious fervor, is more of a political invention than the truth. After it is all said and done their biggest hope is not to die alone in a nursing home. That is a tragic view of life but many many people go through life that way? The communion of the saints tells us that our life has more purpose and meaning than that. They are witnesses that we are citizens of heaven with them, which means that in this life we are ambassadors of a heavenly kingdom. We are ambassadors of a heavenly kingdom that will come to earth and make all things new. We are a part of, what Dallas Willard calls, a divine conspiracy to supplant the kingdoms of this world with the kingdom of God. The communion of saints is witness that we are to live this life in light of the reality of that coming kingdom. It remind us that this life is preparation for the life to come and so while the secularists store up their riches on earth, we store up ours in heaven. While they seek revenge, we are to forgive. While they demand retribution, we are to extend mercy. While they divide we are to have a ministries of reconciliation. While they live life with a tight fist, we live life with an open hand. While they think that whatever they have it is rightfully theirs, we know that it all belongs to God. While they live in fear, we live in faith, hope and love. The communion of saints is a witness that what we are told about life in the kingdom is true. While we are to be inspired by their witness and devotion, we must know that our ultimate model and the perfecter of our faith is Jesus. The saints do not detract from His glory any more than the angels do and it is together with them that we raise our voice of praise. So I believe in the communion of the saints. And if you get real quiet, you might just hear them cheering you on. Amen.